Award-winning filmmaker Liz Garbus presents a fascinating portrait of one of the most intriguing and enigmatic figures of the 20th century – World Chess Champion Bobby Fischer. Out in cinemas 15 July, Bobby Fischer Against the World traces the Grand Master from child prodigy, to Cold War hero, to controversial recluse. Cutting interviews with Bobby and the people who knew him with footage and news reports, Bobby Fischer Against the World is a mesmerising portrait of the rise and bizarre fall of one of the great American icons. In 1958, 14-year old Robert James “Bobby” Fischer stunned the chess world by becoming the youngest Grand Master in history, launching a career that would make him a legend. Raised by his mother in Brooklyn, he taught himself to play chess at the age of six and started beating seasoned adult chess players at eight. Throughout the sixties, as his star rose, Bobby would appear regularly on TV and tour the world resoundingly beating all. His career highlight came in 1972 when he played the Russian Grand Master and reigning champion Boris Spassky - a series that was equally tied in with the Cold War as it was with chess. After his victory, Bobby became the most famous person on the planet and his already erratic behaviour began spiraling out of control, turning this genius into an unrecognisable recluse and pariah. Director Liz Garbus (Emmy Award® winning Ghosts of Abu Ghraib and Academy Award® nominated Street Fight) has crafted a complex film of a complex persona, exploring issues such as whether Bobby was ever equipped to deal with the fame and the pressures of being in the public eye; how his fractious relationship with his mother may have contributed to this; and how he propelled chess to a world-wide phenomenon, boosting it to a level of popularity not seen since. 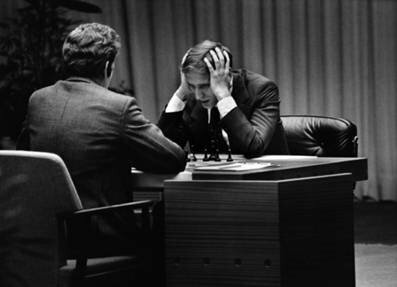 Truly unique, Bobby Fischer still stands as the most famous Grand Master, a life devoured by his obsession with chess and whose death revealed nothing about what eventually destroyed him.